The LIN Board is a full-featured board for LIN bus. It includes a LIN bus transceiver MCP201 providing a physical interface between a microcontroller and LIN half-duplex bus. It is intended for use in automotive and industrial applications. 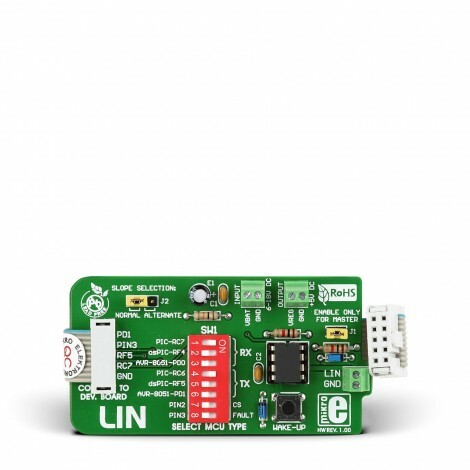 The LIN Board features an MCP201 that provides a physical interface between an MCU and LIN half-duplex bus. It is intended for automotive and industrial applications with serial bus speeds up to 20 Kbaud. It also provides a half-duplex, bidirectional communication interface between an MCU and serial network bus. It is used to convert CMOS/TTL logic levels to LIN logic level, and vice versa. Key Benefits Automatic thermal shutdown.